Largehearted Boy: Book Notes - Russell Quinn "The Pickle Index"
Book Notes - Russell Quinn "The Pickle Index"
The Pickle Index, a collaboration between Eli Horowitz and Russell Quinn, illustrated by Ian Huebert, is an innovatively told and imaginative novel available in three distinct and wholly entertaining editions: hardback, paperback, and app. "You know when you find a book that feels original and fresh and weird in just the right way? The Pickle Index is such a book. Eli Horowitz has created a carnival world a little like that amazing place Katherine Dunn took us to in Geek Love. But this book has more laughs." 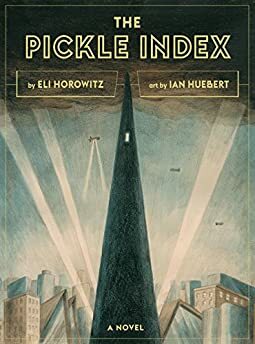 The Pickle Index is a novel that's simultaneously a hardcover, a paperback, and an immersive smartphone app that disseminates the story via a fictional recipe-sharing network with mini games. It was also a collaboration between Eli Horowitz and myself. We each did a lot of different things, but Eli mainly wrote the words and I mainly wrote the software. We spoke a lot on the phone and by email and sometimes in person. In the entirety of the three-year project I can't remember us ever purposefully listening to music together. Eli came over for dinner once and I think I was playing something kinda sensual and he didn't like it. Another time — during a three-week stint in the Canadian mountains — we were waiting for a car ride and he put in headphones so we didn't have to talk. I think it was the week Carrie & Lowell came out. We'd spent all day talking, so it was a smart move. Most of my tasks on the project fell into one of three categories: designing, programming, admin. Each comes with different musical demands. The app is supposed to be a fictional device in a slightly goofy faraway land. I'd mainly listen to chart hip-hop while designing, to feel driven and weird. Three years is a long time to work on a project. Drake went from Soft Drake to Tough Drake in that time. I love them both. Nicki Minaj — "I Am Your Leader"
Rae Sremmurd — "No Flex Zone"
DJ Khaled — "Suffering From Success"
Angel Haze — "New York"
2 Chainz — "I'm Different"
My use of music while programming is the most specific of the three. I often need music to focus, to block out distractions. Because of this, I usually play the same songs over and over — songs I've heard so many times that they no longer register. Sometimes I just need sixty seconds of something familiar to get through a tricky logic problem. It's the fastest way to control the external environment. White noise. Townes Van Zandt — "Dollar Bill Blues"
Harry Harris — "The Ballad of Ronnie Radford"
It's often late at night when I get around to answering emails, bookkeeping, calculating sales tax, and looking at acquisition funnels. The mental vacuum of administration lets the self-doubt creep back in. Why am I doing this? Who at the IRS thought section 170(e)(3) was a good idea? Why the hell am I making an app about pickles? I always reach for the saddies. Fiona Apple — "Every Single Night"
James Blake — "The Wilhelm Scream"
Blood Orange — "You're Not Good Enough"
Scott Walker — "The World's Strongest Man"
Bruce Springsteen — "The River"